Spinal Stenosis is a narrowing of your spine. 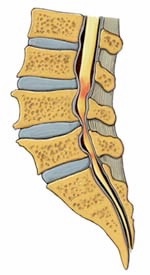 In a more detailed explanation, spinal stenosis is when the channels that your spinal cord and nerve roots travel through become narrower-so narrow that your spinal cord and nerve roots get squeezed. Doctors often call this squeezing "compression." Since spinal stenosis can gradually develop as you age, the symptoms can also gradually develop—and gradually get worse. Also, symptoms can vary a great deal. You may have no symptoms at all, since narrowing of the spinal canal or other channels does not always compress the spinal cord or nerves. But when your spinal cord or nerve roots become compressed and squeezed, you'll feel it. Your symptoms also depend on where your spinal canal has narrowed. Generally, spinal stenosis affects your low back (lumbar spine) or your neck (cervical spine). It's not as common to have stenosis in your mid-back (thoracic spine). Symptoms of Lumbar Spinal Stenosis: Spinal stenosis in your low back (lumbar spine) can cause pain or cramping in your legs when you stand for long periods of time or when you walk. The discomfort usually eases if you bend forward or sit down, but comes back when you stand upright. Think of it this way: as you walk through the grocery store, does leaning forward on the grocery cart reduce your pain? Pain that eases when you bend forward is typical of lumbar spinal stenosis. This type of pain is called pseudoclaudication, false claudication, or neurogenic intermittent claudication. Other symptoms of lumbar spinal stenosis besides pain may include numbness, weakness, or tingling in the leg or foot. In severe cases of lumbar spinal stenosis, nerves to the bladder or bowel may be compressed, which can lead to partial or complete incontinence. If you're having problems controlling your bladder or bowels, you should seek immediate medical attention. Symptoms of Cervical Spinal Stenosis: Spinal stenosis in your neck (cervical spine) can cause pain in the neck and shoulders. It may radiate down your arm or hand. Cervical spinal stenosis can also cause headaches, numbness, or muscle weakness. It can also affect the nerves that control your balance, which can lead to clumsiness or a tendency to fall. The pain from cervical spinal stenosis may be occasional or chronic, and it can also range from mild to severe. •Many years ago, spinal stenosis was called "creeping paralysis" because it gradually gets worse as you get older. Most people thought that once it started, there wasn't much you could do to stop spinal stenosis. Along with forgetfulness, the pain from spinal stenosis was assumed to be just another part of growing old. •Diagnosing spinal stenosis can be difficult because the symptoms can mimic those of other conditions. For example, pseudoclaudication, the leg cramping that can occur with spinal stenosis, can be confused with vascular claudication, a condition of the blood vessels. Here's how you tell the difference: vascular claudication is worse when you walk uphill and improves when you stand still. Pseudoclaudication is usually worse when going downhill and gets better when you lean forward or sit down. •The risk of developing spinal stenosis increases in those who are over 50.